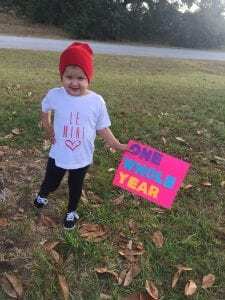 Celebrating one year of remission! A beauty inside and out, three year old Julissa has remained strong since her journey with acute lymphoblastic leukemia began last December, changing the family’s entire life in the blink of an eye. Julissa stopped attending school and underwent three weeks of intensive inpatient treatment at UF Health Shands Children’s Hospital in Gainesville, Florida. The little warrior that she is, Julissa entered remission at the end of 2015. To ensure the leukemia never comes back, she will continue treatment until March 2018. Julissa’s current regimen includes chemotherapy through her port once a month in addition to regular steroids, oral chemotherapy and spinal taps. Her mom Christine has had to stop working to keep up with all of the required appointments. Her battle has been emotionally, physically, spiritually and financially tiring. For the first time in their lives, Julissa’s family found themselves struggling to pay some of their bills. They turned to their social worker, who introduced them to Family Reach. We were able to step in and help assist with their mortgage payment. “Just when we started to worry, you lifted a huge burden off of our shoulders. We are forever grateful for that. You have no idea what it meant to us! Thank you for caring about families like mine. You have made a difficult journey much more bearable because of your kindness and generosity,” says Christine. Ever the energetic, playful and active little girl, Julissa is her family’s miracle and continues to thrive each day.